The two juvenile phoebes in the family I have been following seemed to have seen the same feeding feast that the Cedar Waxwings were enjoying and soon flew several hundred feet upstream from where they have been foraging to join in. After awhile this young phoebe perched on the fence only about 25 feet from me. It seemed almost overwhelmed by the number of insects, possibly from a localized caddis hatch, that are flyinItg around and near to it. The phoebes very black head stands out relative to it's body in this clip. It's tail is getting shaggy as it may be losing rectrices in a molt. After feasting for about 30 minutes, the insect hatch appeared to be over--the waxwing flew off upriver and the two young phoebes returned to where they have been foraging for days right near their nest location. SeEtta --don't forget to double-click on the box with the 4 arrows in the bottom right corner of the video clip to enlarge it to full screen viewing. the organization's bylaws. Members present at today's first telephone meeting were Lynn Barber (chair), Bryan Patrick, Michael Retter, Bob Warneke, Dan Williams, and Rick Wright. The committee is interested in all suggestions from interested birders. A report, or in the case of divergences of opinion, majority and minority reports, will be completed by September 13.
rather not post to birdchat. Here is a blog called Aimophila Adventures with more provocative thoughts about the American Birding Associations current crisis. There are also some interesting comments below it. The more I read on ABA, the worse it gets. The following is from Jon Dunn as posted as a comment on Kenn Kaufmann's blog, "ABA AS NOW CONSTITUTED IS A STRUCTURALLY CORRUPT ORGANIZATION and unless that changes the rest is just a waste of time." Wow! Another part of a comment on this on Kenn Kaufmann's blog, this one from Brush Freeman, "I dropped ABA in part because it became more and more a less GREEN org., touting the 'who gives a flip" accomplishments of individuals that burn barrels of oil chasing a single species for some sort of stupid list. Frankly no one cares about my list or yours, so why does ABA even bother with this garbage anymore..?. " You go Brush! This morning I stopped by briefly to check on the phoebe fledglings progress. I only saw one fledgling, one that I believe to be slightly but noticeably larger than it's siblings (I know, they all look alike but I have been observing dozens of phoebes over the years and some for weeks on end, and I have found that many do have plumage that is subtly different). It was located near the nest site and appeared to be alone. It flew out after a number of insects with only occasional success. After a time the adult bird appeared, caught an insect which it fed to the fledgling--again the adult is supplementing the fledglings food but letting it practice. Though I got some video, I had a meeting for which my Audubon chapter has conservation concerns so I haven't had time to edit and upload it. 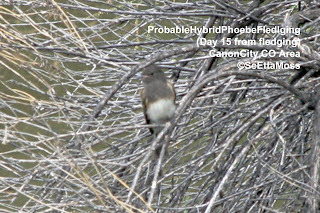 But I wanted to get some additional info out about this probable hybrid phoebe family. While I watched yesterday morning, the parent bird fed each of the two young for 5-10 minutes. 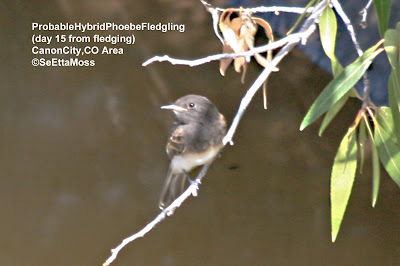 Then the adult flew to the opposite sided of the Arkansas River quickly followed by the apparent fledglings (since they aren't independent yet, they are still fledglings). The adult flew out a number of times capturing insects in this area. After a few minutes, the adult flew to another location on the south side of the river where it sallied out and caught a number of insects. Each of these locations are places along the Arkansas River where I have seen many previous phoebes feeding and I associate them as good feeding locations--it would seem that this adult bird does also. Phoebe young still being fed!